I don't know where they're gonna lead anymore. But I think I must have seen a ghost. I don't know if it's my illusions that keep me alive. I don't know what I've seen. All a mirage gone bad? I don't know if it's already crashed on the shore. I can't tell if it's you or me who is driving us into the ground. Who's trying to see in the dark. Who jumped into The Volcano. Back into the womb of the world? All I've got left is the taste of salt in my mouth. But I know where I'm going-to that volcano. Just want to warm my bones on that fire awhile. This ballad closes Modern Guilt. One report referred to "Volcano" as a "cranked-up" Sea Change song, but I'm not quite sure what's so cranked about it. It is a pleasant and laidback, but still thought-provoking, tune. This album contains many songs about searching: a search for home, a warm place, a rest from the hectic world, etc. "Volcano" pretty much sums that up nicely, and that's why it works so well as the end of the album. First, I'll say that this is a true story. A Japanese girl did jump into a volcano in 1933, and it led to over a thousand copycat suicides in 3 years. The volcano now (Mount Mihara) has more security, but is still referred to (one headline calls it "the world's most romantic death spot"). 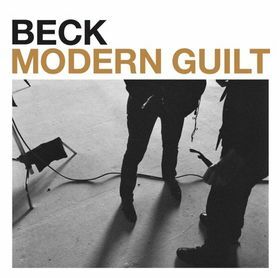 Beck uses this as a metaphor for the Modern Guilt search; the volcano being a place to "warm my bones on that fire awhile." Beck isn't depressed with life though, he doesn't want to jump in. He is just weary and disillusioned, and finds the story of the Japanese girl striking. Heading to that volcano is a way of connecting to something, anything, and that brief connection will bring him back to life. It is analogous to art in that way: connecting to a movie/book/music can be invigorating. There's a lot of earth throughout Modern Guilt too, like tidal waves and rivers and volcanos and whatnot. It fits into the album; as Beck sings about being disconnected from society/people, he is keenly aware of the nature around him. "Volcano" also conveys that idea. "Volcano" might be Beck's most straight-forward song; not that it isn't a metaphor, but it reads very much almost as prose, the thoughts of a person wandering. For that, it strikes me as a unique song for Beck, and perhaps a meaningful one. Beck never really played "Volcano" live very often, just 4 times that we know about. I am not sure why, maybe the laidback and less-dynamic nature of the song pulled it from the band's radar. Two of the shows he did it at were smaller, more spontaneous warm-up events. The final time was in Japan, where it seems a natural choice for him to do.